If you’ve been washing your own clothes for long enough, you’ll likely have run into the problem of shrinkage. It’s a problem that tends to strike natural fabrics most severely – but it’s something that can also occur with synthetics. Fortunately, there are ways of minimising this phenomenon – or even avoiding it entirely. Shrinkage is driven by a combination of several different factors. Firstly, many natural animal fibres will naturally contract when the temperature rises. The surface of animal hair is comprised of tiny scales, which will crowd together in response to heat. The result is a garment that shrinks in the wash. This is most evident in woolly jumpers, which can shrink severely when exposed to extreme washing conditions. Secondly, many clothes made from natural fabrics are manufactured under tension. When stress is applied to the fabric, this tension begins to relax – causing the fabric to return to its natural state, and the garment to warp. Synthetic fibres tend to be more resistant to this than natural ones, as they’re processed especially to remain stable at a wider range of temperatures. If you’re washing a cotton item, be sure to be gentle – especially if you’re washing it for the very first time. Finally, some shrinkage will occur as a fabric soaks up moisture, since the fibres will relax. The severity of this effect will depend on how absorbent the fabric in question is, but generally it’s the least severe sort of shrinkage – so much so that you’ll barely notice it. How can I prevent shrinking? Once you’ve established what’s causing the problem, you can start to do something about it. Your efforts will mainly focus on reducing the heat our clothes are exposed to, but you should also consider other factors like the kinetic action of the drum. Be sure to use a colder setting on your washer – ideally thirty degrees or less. You’ll also want to use the mildest detergent you have available, and set the agitation cycle to the most gentle possible. This will ensure that the motion within the drum is kept smooth, and stress on the fibres is minimised. 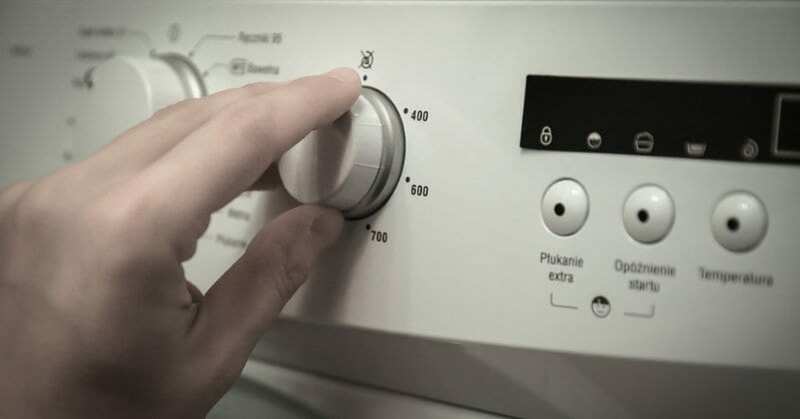 It’s when it comes to drying that the greatest amount of stress is placed on your clothes, as a tumble dryer will use heat to evaporate the water soaked into the clothes. The solution is much the same as it is with washing – use a lower temperature. You might wish to remove the clothes slightly before the end of the cycle and allow them to air-dry while they’re still slightly damp. This will allow you a compromise between the speed of a machine dry with the gentle action of an air-dry. What’s more, you’ll be able to avoid the extreme damp and mould that can affect a home that’s forever filled with hanging, wet clothes. What should I not put in a washing machine or tumble dryer? · Anything labelled specifically as dry-clean only – attempting to do so can ruin the items. · Anything labelled as wipe-clean only – like cuddly toys and certain sorts of furniture cover. These items often contain items that are unsuitable for immersion. · Bras. These come with hooks which can sometimes get caught on the inside of the drum. If you want to wash them in a machine, place them inside a suitable washing bag. · Loose change, zips and other hard items – be sure to check your pockets for coins, as these might fly loose and damage the inside of the drum. Once your clothes have shrunk, it’s remarkably difficult to get them back to their original shape. This is why it’s especially important to take care to prevent shrinkage in the first place. That said, a malformed item of clothing might be rescuable – by rewashing a woollen sweater, for example, you might be able to reverse the contraction of the tiny sales which form the surface of the wool, thereby restoring some of its original shape. This sort of thing is, suffice to say, an inexact science. There’s no real way of telling what shape an item will end up in, and if you’re not careful, you might well end up making the problem worse. Can I shrink something deliberately with a tumble-dryer? If you’ve lost a little weight recently, or bought an item of clothing which you think might look better if it were a little bit snugger, then you might be contemplating shrinking it yourself using your tumble dryer. Unfortunately, it’s impossible to control the rate at which your fabrics will shrink using this method – and the shrinkage will almost certainly not be uniform across the entire garment. This sort of exercise, then, is almost always doomed to failure. Don’t try it – you’ll ruin your clothes! When you’re shopping for clothes made from natural fabrics like cotton, an enormous amount can be gleaned from the label. Look for the term ‘pre-shrunk’ – this indicates that the fibres have been shrunk before the garment has been assembled. This will lead to less shrinking over the course of its lifespan. The label will also offer other useful information on how to launder the item. Certain sorts of clothing are more resilient than others. Synthetic fibres might be able to withstand more punishment, but natural ones like cotton and wool will be more sensitive. By reading the label, and separating your clothes from one another, you’ll be able to guard against shrinkage. But perhaps a better approach is to simply turn the temperature down on every wash – not only will you reduce shrinkage, but you’ll save energy, too!